"Kingsford Island. In the middle of the annual Bombora Surf Competition. At the start of one hell of a storm." There's an allure about noir stories. It might be in that the characters (both male and female) all seem to be strong-willed and determined. Or it might be that the crimes themselves are relatively simple on their surfaces, but digging deeper finds that things just aren't that simple. 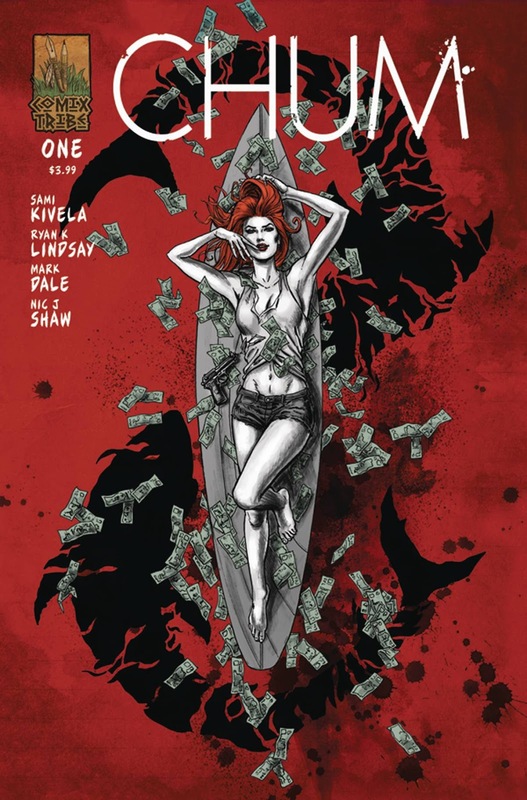 Chum #1 from ComixTribe dives under the surface for a noir tale rife with complications. The issue is written by Ryan K. Lindsay, illustrated by Sami Kivela, colored by Mark Dale and lettered by Nic J. Shaw. Summer Stanwyck is trapped. She tends bar on the island she grew up on, the local cop is about to become her ex-husband, and she's wasting time screwing the local reefer kingpin. 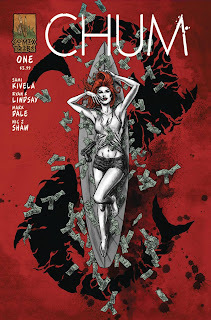 But when a bag full of cash and drugs appears, she sees a way out... and anyone who gets in her way is shark bait. Chum #1 is definitely a slow burn, but it's one that works very, very well. Lindsay spends the first part of the issue introducing the key players and setting up the scenario for the remainder of the series. Each character definitely fits a specific stereotype that comes along with a noir story and the interactions amongst these characters is what makes the story tick. The pacing is very methodic as Lindsay seeks to establish the stakes for all of the main characters. And Lindsay doesn't shy away from lending the book a noir sensibility primarily through the pulpy setting of a beach in Hawaii and the fact that the characters' lives are all intertwined with one another in relatively fascinating ways. Kivela's lends very clean and distinct linework to the book that really helps depict the setting to the reader. Most renderings of Hawaii offer blue water and sunny skies, but Kivela instead focuses on a somewhat rundown diner on the beach to bolster the book's pulp credentials. Each character is illustrated with a sense of purpose to their actions that force the reader to pay attention as they thumb through the pages. And Kivela draws the characters relative to one another that frequently has them sharing a physical space in a way that detracts from their privacy--it's clear that everyone involved is so in a relatively intimate fashion. Dale uses colors that are largely muted, yet Penny's red hair pops in a way that both centers the story on her and parallels the blood that the characters so freely shed. Chum #1 is a really sharp and entertaining. Penny knows she's in too deep, but she's pretty powerless to do anything about it. Lindsay's script doesn't waste any words and methodically moves the characters into position for an interesting story to unfold. Kivela's illustrations are concise and keep things tidy, offering the reader a distinct enough look that they can get more of the pulp sensibility of things. Chum #1 is a really interesting issue that gets everything ready for things to get really bad, really quickly. Chum #1 is in stores now.